Why Are These Wisconsin High School Kids Doing the Hitler Salute in a Class Photo? The photo was originally tweeted out with the caption, "We even got the black kid to throw it up #barabooproud"
A picture of more than 50 students from Baraboo High School in Baraboo, Wis., doing the “seig heil” salute has gone viral, raising questions of racism at the school and in the town. The picture appears to show a group of young men in suits standing together and saluting. The men in the picture are reportedly members of the 2019 class, and the picture was taken before their junior prom. The salute was allegedly the suggestion of the hired photographer. 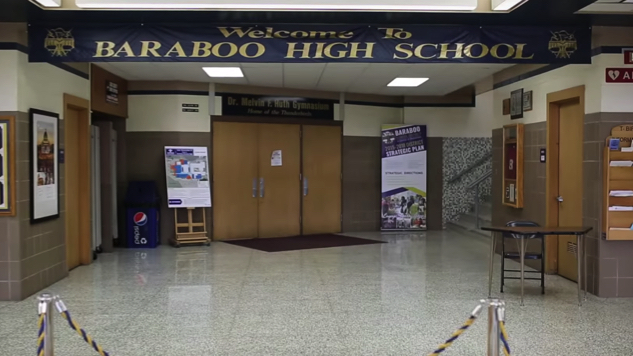 The picture was originally tweeted out by a private account under the handle @GoBaraboo, with the caption, “We even got the black kid to throw it up #barabooproud.” That tweet has since been deleted, but the picture and caption have gone viral, with allegations of racism and administrative inaction at the school pouring in as a result. Find the full Twitter thread here.